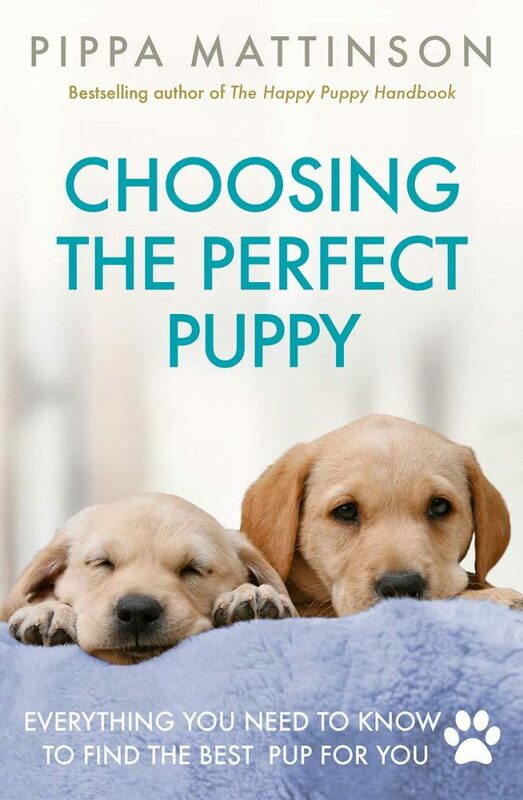 Today we are going to look at how to choose the best rewards to help you train your puppy or dog. And at how to use those rewards effectively. It isn’t complicated, but it is important that you understand the principles involved. So we’ll be giving you a simple set of rules to follow. It has long been known that using rewards can encourage good behavior. [wp_ad_camp_5]In dogs as well as people. And what could be nicer than giving treats and toys to a much loved puppy? So in principle it’s a great idea to combine that pleasure with improving your puppy’s behavior. Most of you will know of puppies – and people too – that get plenty of treats and have dozens of toys, yet are not very well behaved at all! So you’ll want to find out how to use rewards effectively, to help your puppy grow up to be a well mannered dog, and not just a spoilt one. You’re going to need to be a bit clever with the way you use and choose rewards, if you are to make the most of them. And that is what this article is all about. Dog training is about changing behavior. We get rid of behaviors we don’t like, such as whining and jumping up. And teach, or increase, behaviors we do like, such as ‘sit’, ‘down’ and ‘stay’. As the study of animal behavior science has developed, we have discovered more about how and why rewards work to change behavior. Put simply, rewards increase the likelihood that the behavior they accompany will be repeated. They are what we call reinforcers of behavior, they make behaviors stronger. Think of reinforced concrete! Used properly, rewards strengthen behavior and make it more reliable and dependable. [wp_ad_camp_2]All animals respond to well timed rewards (reinforcers), by repeating the reinforced behaviors more frequently. It’s just natures way of making sure that they thrive. If digging in a certain place always gets you something tasty to eat, or moving in a certain way stops another dog from attacking you, well, it makes sense to do it again. Repeating beneficial behaviors is one way that we learn to use the environment to our advantage. Fortunately, you can make use of this basic learning system and turn it to your advantage, to help your dog learn to be good! Used effectively rewards are a powerful tool and can allow us to diminish or even abandon the use of corrections in our dog training programmes. But the key word is ‘effectively’. The last thing you want is to bribe your dog to behave well, or to waste your time or money on rewards that don’t work at all! Let’s look at some of the rewards that dog trainers have traditionally used. Traditionally, rewards for dogs have been a kindly word, a pat, or some praise. Especially during early obedience training. These are the rewards I used when I first started dog training. If you trained your first puppy a few years ago, they are probably the rewards you used too. Unfortunately, there are some problems with this approach. We now know that verbal encouragement and petting are of relatively low value to most dogs. Behaviorist have understood this for a long time, but we now have studies to help us understand and accept just how ineffective praise alone is, in changing canine behavior. Fortunately there are much more powerful rewards available to dog trainers. What happens when you rely on praise? Because petting and particularly praise, are not highly valued by dogs, trainers who try to rely on these low value rewards, will also need to use ‘corrections’ (or mild forms of punishment) during the training process if they are to be successful in creating an obedient response to their commands. Because of poor choice of rewards, for a long time, it was widely believed that it was simply not possible to effectively train a dog without some kind of corrections. And that dogs who were not punished would grow up wild or badly behaved. However, we now know that not only were these traditional trainers often using their rewards ineffectively. For the most part they were using the wrong rewards. In fact they often weren’t using rewards at all. What is a good reward for a dog? If we are going to use rewards to train a dog effectively, we first need to establish what defines a good reward. A good reward for any dog is something he values. By definition, it is a reinforcer that has the potential to increase or strengthen behavior. If a pat on the head is not increasing your dog’s enthusiasm for sitting, then it is not reinforcing the sit. And a reward that is not reinforcing the behavior you want isn’t much of a reward. The best reward to use in training a new behavior, or in teaching a known behavior in a new place or in a more challenging situation, is a reward which has a very high value for the dog. Rewards which have a high value tend to be associated with basic drives such as hunger and thirst, or which satisfy powerful instinctive drives such the urge to hunt or chase. Later in training, as your dog becomes more ‘fluent’ at responding to your commands, you can use lower value rewards and decrease their frequency. We’ll be looking at fading rewards in this way, in another article. But for now, HIGH value is the key. The right reward for your dog is one he values highly. And that is convenient, and quick for you to deliver. If your dog is an obsessive chaser of balls, you are going to have much more success training him using balls as a reward, than you are using praise or petting. On the other hand, you don’t want to spend ten minutes delivering a reward to your dog for a single ‘down’ as you want to be able to fit at least ten more ‘downs’ into your training session. Of course, just like us, different dogs are passionate about different things. Dogs trained to sniff out drugs or explosives are often chosen as young adults for their ‘ball drive’, because the more intensely they want that ball, the easier they are to train. However, if you bought your dog as a puppy, you don’t get to select him based on his likes and dislikes, so you have to work with what you have got. Nine times out of ten, the best choice of reward for any puppy is initially food, simply because all dogs like to eat, and because a dog can swallow a tiny treat in less than two seconds. But toys can also play an important role, especially later on in the training process. As training progresses, you’ll get more opportunities to use toys and games to reinforce behaviors, if that is what your dog enjoys most. Getting reward values right is all about empathy. Put yourself in your ‘dog’s shoes’ and figure out what he really finds attractive. Some dogs value certain activities more highly than others. 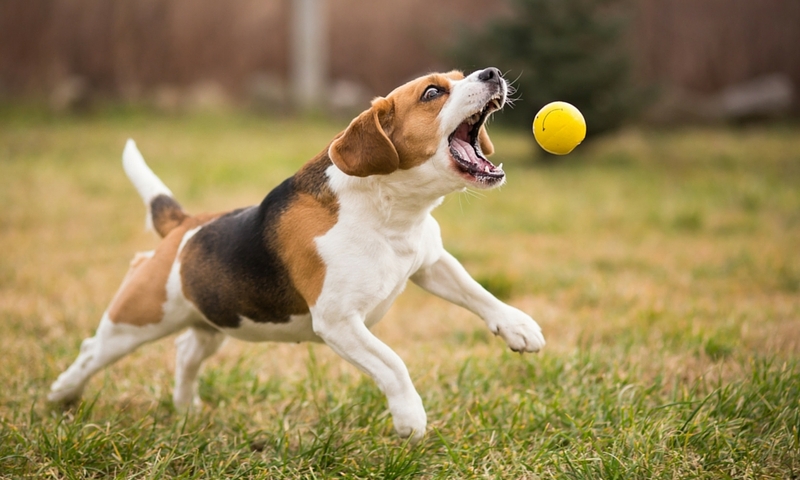 Not every dog loves to chase a ball, or catch a toy, but many do. Others may enjoy tugging on a rope for a minute or two. And you can influence your dog’s attachment to certain toys by restricting access to them so that they are more special. With one or two exceptions, all service dog, and dogs trained to high levels of obedience nowadays, are trained using toys and/or food. This includes police dogs, military dogs and guide dogs. Dogs who sniff out explosives, drugs, diseases, and chemicals. And dogs who compete in obedience, agility, and working trials. 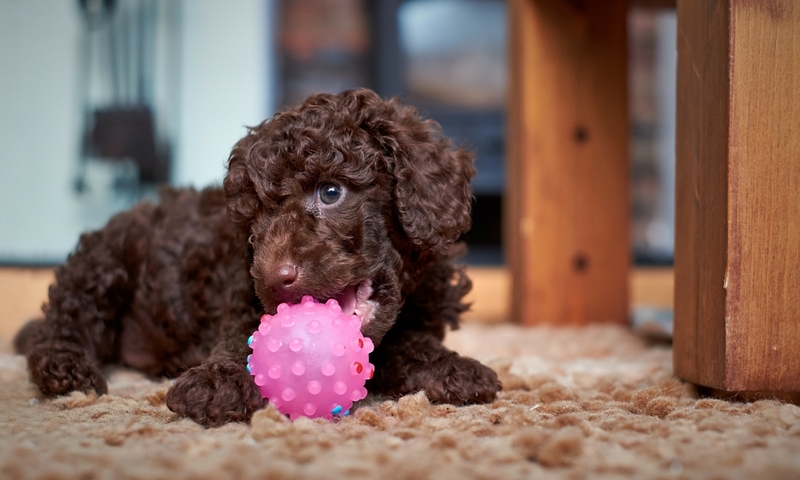 The chances are, food or toys are what you should be using as a reward for your dog or puppy. The main drawback of using toys, is that it takes longer to complete each reward. For that reason alone, no matter how passionate they may be about toys, all dogs should learn to work first and foremost with food. Some people have a mental block about training with food. They associate food with bribery and cheating. I too had this ‘mental block’ at one time, but I eventually got over it. It’s something we all need to ‘get over’. You’ll feel much better when you have put it behind you. It is important that we differentiate between the use of food as a bribe, and the use of food as a powerful reinforcer. Used as a reinforcer, food can create brand new behaviors, and build complex chains of behaviors. It is portable, attractive to all dogs and very quick to deliver. Some people say that their dogs don’t like food rewards, or won’t take them, but this is simply because they are trying to deliver the food when the dog is ‘over threshold’. We’ll look at that some more in another article. All dogs can be trained to work with food, but to avoid this scenario it is a great idea to get your puppy started with food rewards right from the very beginning. A lot of people worry that food could be seen as bribing. So how can we be sure we are not bribing our dogs if we train with food treats? People often refer to food used in training at treats. This does rather imply that in training we use luxury foods that the dog wouldn’t get at any other time. This isn’t necessarily the case. In fact for young puppies, much of their training can simply be done using their normal daily food ration. Just be sure to deduct what you use in training from their daily allowance so that you are not overfeeding your dog. There are also other common household foods that can be used as training treats in smaller quantities. Little cubes of hard cheese or toast are useful and not too messy. When it comes to needing really high value rewards, if you are using food, you’ll need to up the stakes a bit. And this can get messy for a time. Softer foods such as pieces of roast chicken or beef are excellent high value treats, as are various types of tinned fish – sardinnes are popular. Of course, it isn’t just what you use as treats that counts, its also the way that you use them. Let’s look now at bribery. Food offered as an inducement to a dog, is a bribe. Bribery is an ineffective management tool in any dog that is not literally starving. 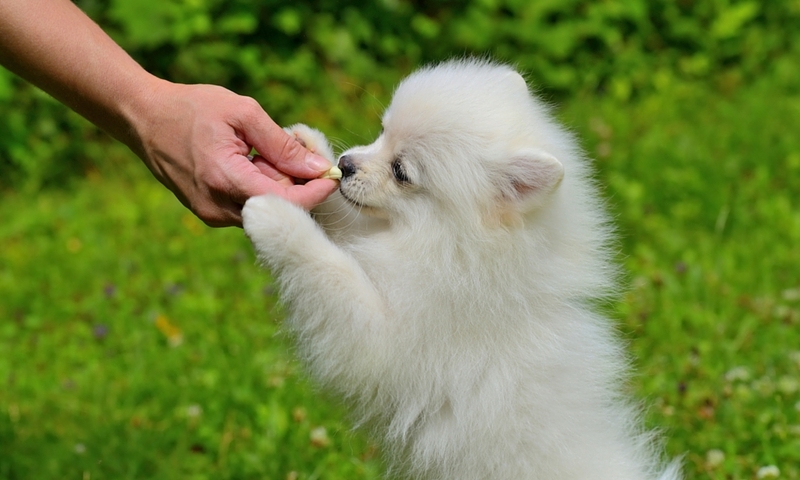 To be sure you are not bribing your dog, make sure you understand the principles of positive reinforcement training. You need to be providing the food as reinforcement at the end of a desirable behavior. Not using the food to trigger the behavior in the first place. Keep your training food in a pouch or pocket and never show food to the dog before he has followed your instructions correctly or offered the behavior you are looking for. In addition, there are a few more rules you need to follow in order to use food effectively as a training tool. Using an event marker can help give you a few seconds leeway, as it enables you to deliver the reward shortly after the behavior has finished. The reward ‘schedule’ describes the proportion of behaviors that are rewarded, and the pattern in which the rewarded behaviors are ‘arranged’. That sounds a bit daunting, but it is easy if we break it down. In a continuous schedule of reinforcement, every single correct behavior is rewarded. If your dog sits ten times, he gets ten rewards, one after each sit. In an intermittent schedule of reinforcement, only some of your dog’s correct behaviors are rewarded, other correct behaviors are ignored. You could for example reward every other sit, so that your dog gets five rewards for ten sits. The problem of this is that the dog can then start predicting which sits will be rewarded, and this may weaken the sits where the dog predicts no reward. In a random schedule of reinforcement, the rewards are ‘intermittent’ and there is no logical pattern to the way in which ‘rewarded’ behaviors are arranged. This means that the dog cannot predict which correct behaviors will result in a reward, and which will be ignored. This is important because studies have shown that if dogs can predict when ‘no reward’ is coming, their performance will suffer. Why not reward dogs continuously? The benefit of intermittent reinforcement is that it can help to ‘fix’ or strengthen behaviors by making the reward seem more attractive or valuable. In nature, rewards are rarely predictable or continuous, and animals have adapted by developing ‘persistance’ in the face of intermittent rewards. We sometimes refer to this as ‘the gambling effect’ as it lies at the heart of addiction to behaviors where rewards are unpredictable and variable in value. We can use different schedules of reinforcement, at different points in the dog’s training process. A continuous schedule is used for establishing a new behavior or for training a known behavior in more challenging situations. A random schedule is often used for fixing and maintaining behaviors. A random schedule can vary in reward intensity. It can include many high value, frequent rewards, or it can include just a few low value rewards. Moving from continuous to random reinforcement or from high value to low value rewards, is known as ‘fading’ the rewards. And it can be problematic if not carefully done. If the value or frequency of rewards falls too far, the benefit to the dog may become so insignificant, that your carefully trained behavior begins to unravel. Many people are very keen to ‘get away’ from the use of food in training. Probably due to old prejudices about food being cheating or bribery. The result of this is that inexperienced trainers may fade rewards too far and too fast, with sometimes disastrous results. As a result, some modern professional dog trainers are moving away from fading altogether and recommending that their students stick to continuous reinforcement. My personal feeling is that this is a shame because careful fading can strengthen behaviors. But I can understand why they have taken this approach. When we first establish a new behavior we may need a continuous schedule of powerful rewards. As the new behavior is established and the dog becomes ‘fluent’ we switch to a random schedule of reinforcement, and we ‘fade’ from frequent to infrequent rewards within this schedule provided that the behavior remains strong. But as soon as we introduce a greater level of difficulty – new, more exciting location, more duration, more distance from the handler etc, we need to ramp those rewards back up again. The less intrinsically rewarding the behavior you are asking of the dog, the higher the value of reward you may need to use. Many people try and reward too infrequently, too soon. Or even abandoning rewards altogether. If you are walking a young dog at heel on a lead for example, and you don’t want him to pull, your rewards are going to need to be very frequent indeed to begin with. Possibly every two or three seconds in areas of distraction. This won’t last forever, but if you try and move away from rewards too quickly you can easily end up with ingrained problems like pulling on the lead. Abandoning rewards altogether will result in your trained behavior dying out. Or, you will end up resorting to punishment to get the results that you want. When we begin to introduce distractions into our dog training sessions, we may need to return to using very powerful rewards indeed. It is one thing to ask a dog to sit and stay in your kitchen, it is quite another to ask him to sit and stay whilst a group of dogs is playing nearby. The more powerful the distraction, the more powerful the rewards need to be. Initially. We also need to return to our ‘continuous schedule of reinforcement again. It is possible to train a dog to a very high standard using only rewards. Provided that those rewards are chosen and delivered carefully. We need to follow a few simple rules. If you stop rewarding altogether, your training will die unless you start punishing your dog. 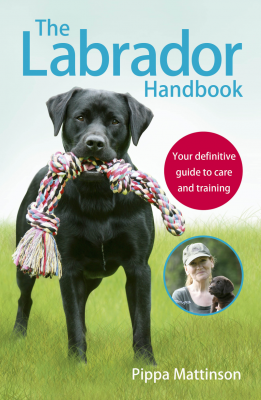 Modern dog trainers tend to use more powerful rewards in their dog training programmes than traditional trainers did. These rewards include food, and activities that the individual dog is strongly attracted to. These activities may vary from one breed to another and may include tug games or opportunities to retrieve a ball or toy. One important development in dog training in recent years has been the recognition that we as owners or trainers, are not the best people to determine which reward is best for each individual dog. [wp_ad_camp_1]It is important to recognise that only your dog can allocate ‘value’ to a reward. Traditional trainers may feel strongly that a dog should work out of love and respect for his owner. And that the best reward for a good dog should be affection from his boss. They may be in denial about the dog’s true preferences. The truth is, only the dog can decide whether it prefers tugging a rope or eating steak, only the dog knows whether catching a frisby has more value to him than a gentle stroke of his ears. Your job is to figure out what he likes best. You can observe how much your dog values a reward, but you cannot initially influence how the dog feels about the rewards you offer him. It all depends on where his priorities lie. If your dog has an abiding passion for chasing frisbees, this activity will be more rewarding to him than the piece of dry biscuit that has been sitting in your pocket since last Tuesday. This is not something you can change in the short term. Although over time you can influence how your dog feels about rewards such as food, by using them cleverly. We look at how to influence this in our article What To Do When Food Doesn’t Work. Good trainers observe their dogs’ actual preference with an open mind and choose their rewards accordingly. They don’t obsess about the fact that the dog prefers playing frisbee to being cuddled, but use the information they have to select the most effective reward for the job in hand. Studies have shown that praise alone is not sufficiently valuable to dogs, to be used as a behavioral reinforcer. 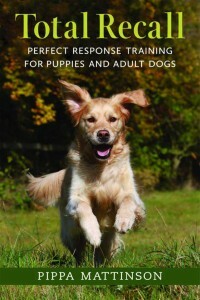 In other words saying ‘good dog’ is not a powerful enough reward to help you create an obedient response in your puppy. Because of convenience and delivery speed, food is often the reward of first choice for serious dog trainers, and many of the exercises in this website use food as a training aid. 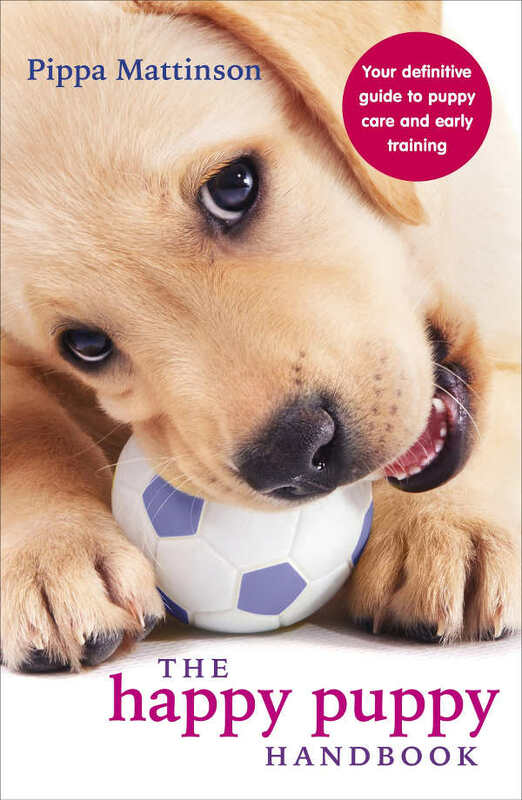 Modern dog training is a whole new ball game, based on proven scientific principles and anyone can succeed at it. The days of a pat on the head for good behavior and a smack on the bum for bad, are long gone. And you are going to have a lot more fun with today’s modern training methods. Thank you! This is great stuff! We just adopted a wonderful boy – GSD/Black Lab mix. He’s eager to learn and I am too! Thank you again, Pippa! Thank you! Do you have any ideas how to work with a Maltipoo?